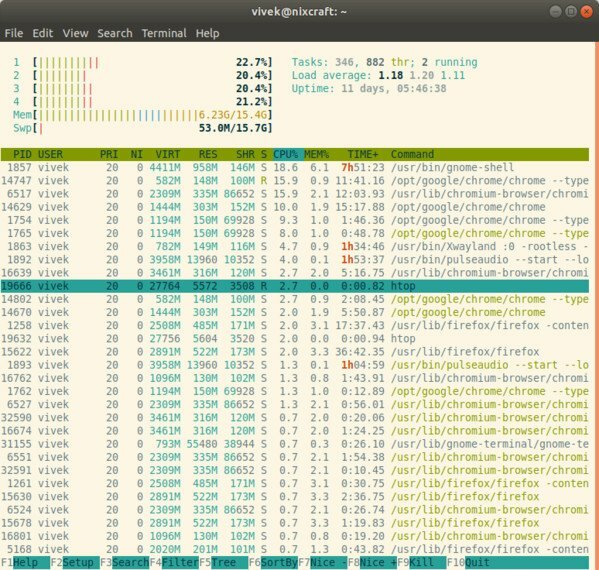 top command display Linux processes. It provides a dynamic real-time view of a running system i.e. actual process activity. By default, it displays the most CPU-intensive tasks running on the server and updates the list every five seconds. t Displays summary information off and on. m Displays memory information off and on. A Sorts the display by top consumers of various system resources. Useful for quick identification of performance-hungry tasks on a system. f Enters an interactive configuration screen for top. Helpful for setting up top for a specific task. o Enables you to interactively select the ordering within top. The vmstat command reports information about processes, memory, paging, block IO, traps, and cpu activity. uptime command can be used to see how long the server has been running. The current time, how long the system has been running, how many users are currently logged on, and the system load averages for the past 1, 5, and 15 minutes. Want To Print A Process Tree? free command shows the total amount of free and used physical and swap memory in the system, as well as the buffers used by the kernel. iostat command report Central Processing Unit (CPU) statistics and input/output statistics for devices, partitions and network filesystems (NFS). Linux display each multiple SMP CPU processors utilization individually. pmap command report memory map of a process. Use this command to find out causes of memory bottlenecks. netstat command displays network connections, routing tables, interface statistics, masquerade connections, and multicast memberships. 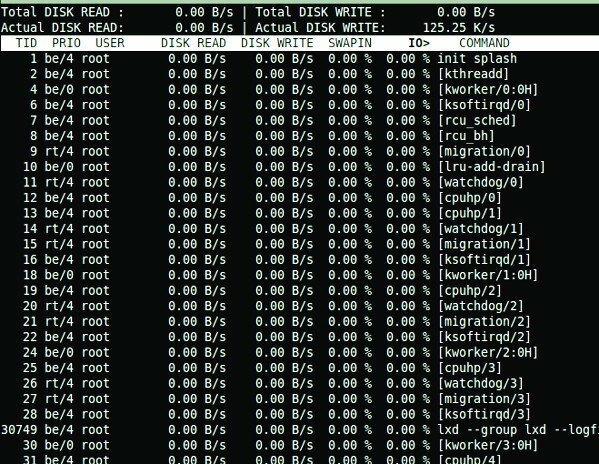 iotop command monitor, I/O usage information, using the Linux kernel. It shows a table of current I/O usage sorted by processes or threads on the server. 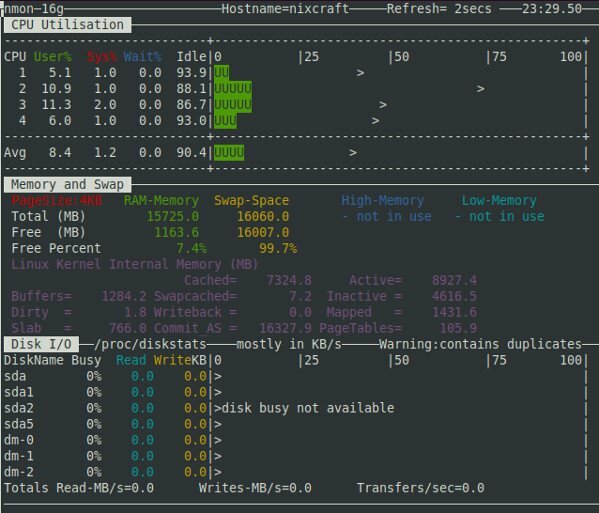 htop is a free and open source ncurses-based process viewer for Linux. It is much better than top command. Very easy to use. You can select processes for killing or renicing without using their PIDs or leaving htop interface. 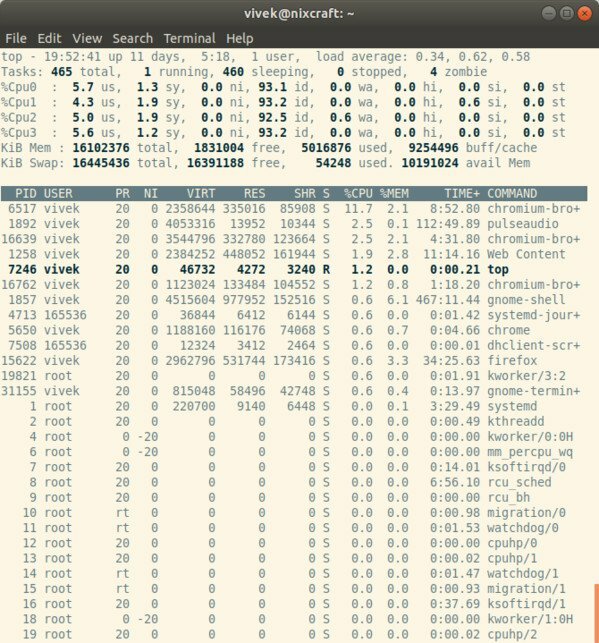 atop is a very powerful and an interactive monitor to view the load on a Linux system. It displays the most critical hardware resources from a performance point of view. You can quickly see CPU, memory, disk and network performance. It shows which processes are responsible for the indicated load concerning CPU and memory load on a process level. NetHogs is a small but handy net top tool. It groups bandwidth by process name such as Firefox, wget and so on. If there is a sudden burst of network traffic, start NetHogs. You will see which PID is causing bandwidth surge. iftop command listens to network traffic on a given interface name such as eth0. It displays a table of current bandwidth usage by pairs of hosts. 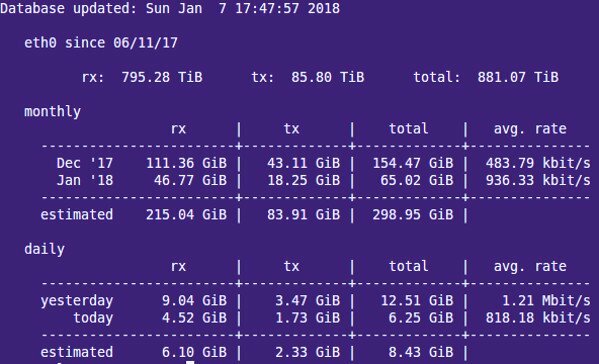 vnstat is easy to use console-based network traffic monitor for Linux. It keeps a log of hourly, daily and monthly network traffic for the selected interface(s). 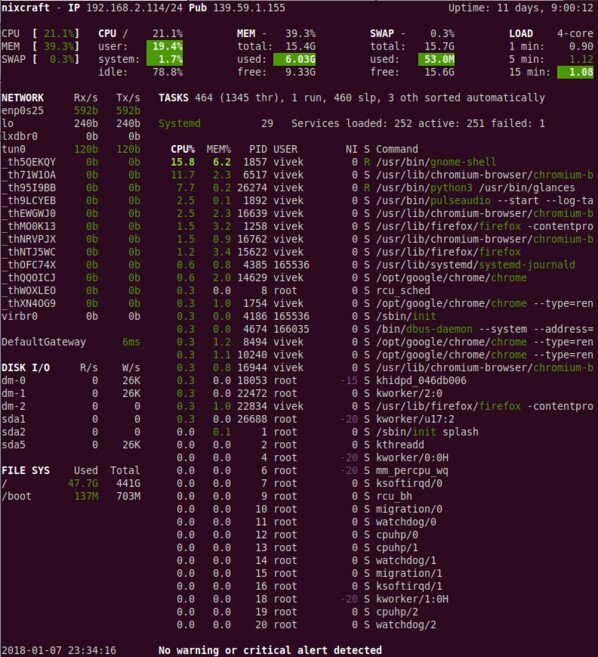 nmon is a Linux sysadmin’s ultimate tool for the tunning purpose. It can show CPU, memory, network, disks, file systems, NFS, top process resources and partition information from the cli. glances is an open source cross-platform monitoring tool. It provides tons of information on the small screen. It can also work in client/server mode. Want to trace Linux system calls and signals? Try strace command. This is useful for debugging webserver and other server problems. See how to use to trace the process and see What it is doing. Did I miss something? Please add your favorite system motoring tool in the comments.